Sweet Bangalow Pork Belly is defiantly one of the finer luxury’s of life so cooking it to perfection will amaze your family and friends. 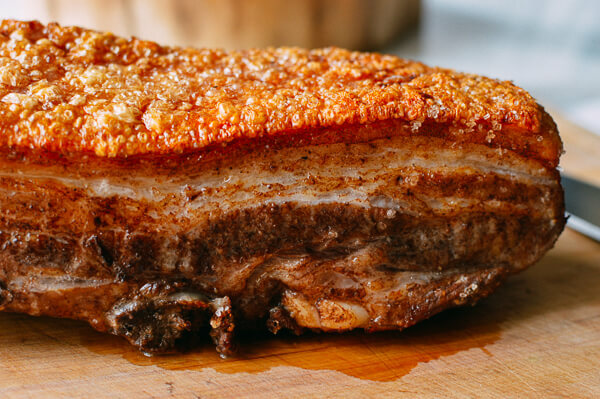 This recipe allows you to roast the Sweet Bangalow Pork Belly and carefully finish off the skin with hot vegetable oil to really make the skin crackle and pop. SERVES- 4 PREP- 4.5 hours minimum COOK TIME- 2 hours approx. Using your fingers rub the red wine vinegar into the skin, using a circular motion rub the sea salt flakes into the skin. Refrigerate Sweet Bangalow Pork Belly uncovered to dry overnight or minimum 4 hours. Place Sweet Bangalow Pork Belly on a wire rack in a roasting tray- skin side up, roast undisturbed for 45 minuets. – At the stage check the pork’s core temperature with a meat thermometer, if it is at 71°C, remove the pork from the oven. – If pork is not at temp, return to the oven and check frequently. Turn the oven down so the temperature of your oven is around 60°C. Return the meat to the oven to rest for 45 minutes. During this time the meat’s core temp should rise to around 75°C- be sure to check. Just before serving, heat the vegetable oil in a small saucepan until it is just smoking. Remove the roasting tin from the oven and carefully spoon the hot oil over the pork skin to finish the crackle. ü Be super careful when spooning the oil over the skin but make sure the oil is very hot, to create the most amazing pork belly crackle.